Siobhan Curham is an award-winning author, and motivational speaker. Her books for young adults are: Dear Dylan (winner of the Young Minds Book Award), Finding Cherokee Brown, Shipwrecked, Dark of the Moon, True Face, The Moonlight Dreamers and Tell It to the Moon. 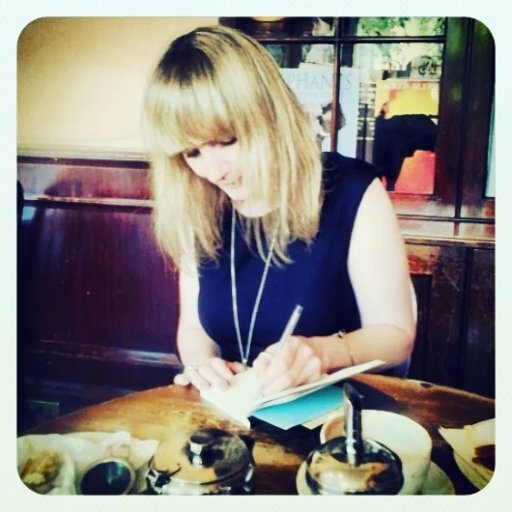 Siobhan has written for many newspapers, magazines and websites, including The Guardian, Cosmopolitan and the Writers’ Forum She has also been a guest on various radio and TV shows, including Woman’s Hour, BBC News, GMTV and BBC Breakfast. Siobhan has spoken at schools, universities and literary festivals around the world, including Hay, Cheltenham, Bath, Ilkley, YALC, YA Shot, London Book Fair and Sharjah Reading Festival. In celebration of Siobhan's latest book release, 'Tell It to the Moon', (the sequel of 'The Moonlight Dreamers'), we have a Q&A with this lovely author, where she answers my questions about these wonderful books. 1. I adored all of the Moonlight Dreamer's differing but strong personalities throughout both of the books. What inspired you to create each character? Thank you! I started with Amber, as I wanted to create a teen girl who was a bit different from the ‘norm’ but fiercely proud of being so. It occurred to me that I’d never read a book about someone with gay parents before, so I added that into the mix – but it was very important to me that this shouldn’t be a big deal. It’s only a big deal in the narrow minds of the school bullies. I also liked the idea of Amber loving all things vintage – including clothes – and so her look, dressing in vintage men’s clothes was born. Then, once I could picture her in her pinstriped suit and pocket watch, it seemed only natural to me that Oscar Wilde would be her hero. Sky came next and she’s probably the most like me, in that she has an Irish dad and she’s a bit of a hippy. At the time I created the Moonlight Dreamers, I was living near a canal and had become intrigued by the people who lived in boats there. It seemed like such a blissful, peaceful life, surrounded by so much nature. So I decided to make Sky and her dad Liam live on a boat and her being home-schooled then seemed like a natural fit. I used to co-host a night at the Poetry Café in Covent Garden, so I drew upon a lot of real-life experiences with spoken word poets when creating that side of her character. Rose came next because I wanted to give Sky a step-sister and make it the most unlikely and dramatic clash of worlds and personalities. For a long time I’ve wondered what it must be like to be the child of famous parents and how hard it must be to get through the challenges of young adulthood in the celebrity spotlight – especially when you haven’t chosen to be there. Rose was a lot of fun for me to write. I enjoyed trying to burst a few preconceptions about fame and beauty through her character. And I loved the argument scenes with Sky – which is why I could resist making them fall out again in Tell it to the Moon! I wish I could be a bit more feisty like Rose. Maali was the last of the girls I came up with. I thought it would be too neat to have them all be the same age, so I decided to make her a year younger and kind of like a loveable kid sister. Initially, her main characteristic was her Hindu faith – religion is an area that I think gets a bit neglected in YA fiction – but she was coming across as a little too earnest. So I asked myself how I could make her character more fun and the idea for her being a hopeless (literally) romantic was born. I had so much fun writing her scenes with Ash. To be honest, it was a little like therapy as I’m similarly useless when it comes to talking to a guy that I like. 2. Why did you decide to use Oscar Wilde as an overarching theme throughout both novels? Oscar Wilde was such an intrinsic part in the forming of the group – the inspiration behind the name and the ethos – there was no way I could drop him as a theme. Amber would never have let me! It’s been great fun introducing Oscar Wilde and his writing to a new generation of readers and, when I was writing Tell it to the Moon, I felt like his life story again had certain parallels with the girls’. Especially when Amber uses him as inspiration to stand up to her bullies. 3. Did you encounter any challenges when writing 'Tell It to the Moon', considering the success of 'The Moonlight Dreamers?' If so, how did you overcome them? The main challenge – and maybe this is true for any sequel – is trying to keep the characters and the storyline as fresh as the first. When I first sketched out a rough plot for Tell it to the Moon, it felt like something was missing. And that something was the fire in my belly I felt for the first book. So, I revisited my ideas for the plot, this time asking myself the questions: What do I REALLY want to write about? What ideas would really fire me up? And I realised that I really wanted to write about how I think the school system is failing so many young people. I also realised that, with Sky starting high school after a life-time of home-schooling, I had a great opportunity to look at the education system through the fresh eyes of someone who’s never experienced it before – and can see all of the flaws. I ought to stress here that I don’t think teachers are failing young people – every teacher I know hates the changes that have been made to the education system in recent years and is finding their job increasingly hard to do. By making Sky become an activist – and be the change she wants to see in the world – I was also tapping into the anger I feel at so much of what is happening in the world at the moment. And my desire for young people to be inspired to take action. Over the past few years, I’ve given talks to students from all over the world and I always come away feeling so inspired by their compassion and desire for equality, justice and peace. Once the activism storyline was added to Tell it to the Moon, I felt the same burning desire to write that I’d experienced with The Moonlight Dreamers – it was like the missing piece of the jigsaw had slotted into place. 4. What is the best experience you have had that has originated from the publishing of 'The Moonlight Dreamers' series? Without a shadow of a doubt it has been receiving messages from readers all around the world, telling me that the books have encouraged them to pursue their own dreams. I love thinking of Oscar Wilde’s words drifting down through time, inspiring the characters and in turn the readers, to dream boldly. 5. What are your top three writing tips for future novelists? 1) Write about the things you feel most passionately about. Not only will it make the writing process a whole lot more enjoyable, but it will make the reading of your work a lot more enjoyable too. The reader will feel the energy burning behind your words. 2) Don’t be put off by criticism – learn from it. Writing can be a very vulnerable experience – or at least, showing other people your writing can. But no-one is capable of writing a perfect first draft, everyone needs a fresh perspective. That’s why published authors have editors. When you’re starting out, don’t be afraid to show other people your work and be open and willing to learn from their feedback. It will make you a much better writer. I’ve learned so much from my editors. 3) Having said all of that, sometimes you will encounter people who criticise your work because they have their own agenda. Maybe they always dreamed of being a writer but didn’t have the courage to pursue that dream, maybe they’re just unhappy for some other reason and seeing you pursue your writing dream makes them feel resentful or insecure. If someone is mean about your work, in a way that isn’t constructive at all, remind yourself that it isn’t personal – even though it can feel extremely personal! Know that it is far better to be pursuing a dream and doing something that makes you happy, than bitching at others from the sidelines and wallowing in self pity. 6. What are your future writing plans? I’ve just finished the first draft of a YA novel which is due to out next April, about a teen footballer from Syria and a budding musician from Britain. It alternates between the girl and boy’s point of view as their friendship forms. It’s great getting the chance to write from the point of view of a boy for once, and to write about the refugee crisis, something I feel really strongly about. It’s set in and around Brighton, which is always a really fun and colourful setting. At the moment it has the working title, Friends Like Us, but I think that may well change. Thanks to Siobhan for answering my questions! Check out my reviews for both of 'The Moonlight Dreamers' books below, and you can visit the website here. I always thought that writer profession is the most creative one. Even if sometimes you can feel that, this plot is very similar to another one, eventually you will understand that it’s unique. However, not all the people have writer skills and able to perform the unique texts. Therefore, when you want to maximize the uniqueness of the text of your term paper you should take help from professionals.